The December BKJK Bowl Monthly Final at Lucky18Casino.com was yet another battle to the finish for a place at the $21,000 BKJK Bowl Grand Final coming up during Super Bowl week. Five more online blackjack players advanced to the $21K Final, January 28 at 6 pm GMT/10 pm EST. There is one more Monthly Final before the Grand Final. Then, like this month’s top five, the top five players in the January Monthly Bowl will advance to the Grand Final. Until then, there are three qualifiers each week for free seats at the weekly finals where free seats to the next monthly final can be won. But those that don’t win their way to the $21,000 BKJK Bowl Grand Final on January 28th can buy-in for $275. 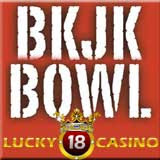 BKJK Bowl will award a total of more than $50,000 in cash prizes. Lucky 18 Casino offers state-of-the-art games and millions in jackpots from Realtime Gaming (RTG), the only one of the major online casino software providers still open to US players. Lucky18Casino’s $1800 Deposit Bonus is the most generous anywhere and they provide toll-free telephone support 24-7 to players around the world including the U.S.